My visit to the fashionABLE factory in Ethiopia two years ago changed my life, and I continue to be inspired by Barrett Ward's infectious enthusiasm and determination to help women elevate their lives. Barrett is truly amazing and it was fantastic to see him in Washington last week at the #AYASummit. Meanwhile, it's fashionABLE's 4th birthday this week so I thought it would be fun to share 5 of my favorite picks from their collection. Go shop! Everything is on sale this week and your dollars will make a difference! 1. I love white scarves (they immediately brighten up your face! ), and the Aster scarf adds punch with a colorful chevron pattern. I just ordered one this morning! 2. This incredible Tizita bracelet trio is made from bullet casings and scrap metal by farmers in the Entoto mountains, a community of healing for those affected by HIV/AIDS. 3. 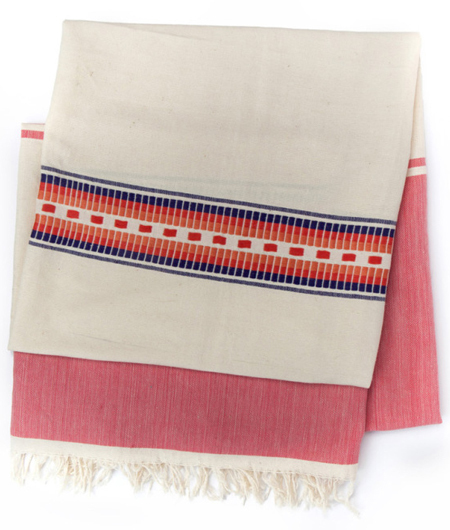 I adore the Mehari blanket, which would serve gorgeously indoors or outdoors. I've been meaning to order this blanket ever since it was released; I did so this morning and can't wait to cozy up under the Mehari on the couch with the girls! 4. The gorgeous Mamuye leather tote comes in three colors; the cognac is perfection. 5. Stack up the awesome with these leather and thread Teshome bracelets.